Local 2559 Negotiating Committee members at Jetstream in Phoenix are ready for their first contract negotiations as IAM members. 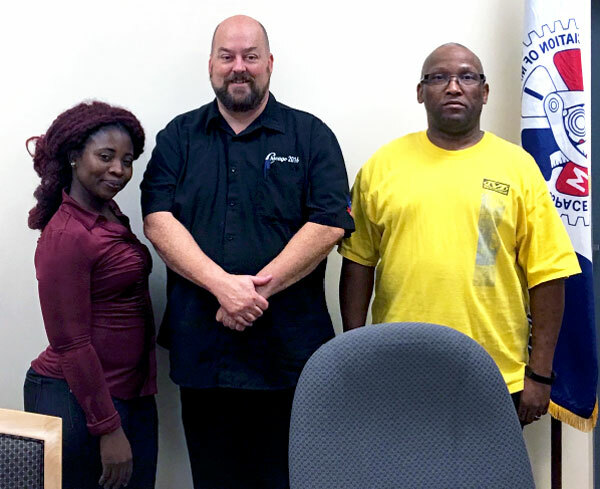 From left: Shop Steward Joyce Amoh, District 142 General Chair Randy Griffith and Chief Shop Steward Ken Fletcher. Phoenix-based Jetstream security and aircraft cleaning workers this week prepared for first contract negotiations at IAM Sky Harbor Local 2559 in Phoenix. Jetstream Negotiating Committee members Joyce Amoah and Ken Fletcher participated in the IAM’s new Field Negotiations Preparation Program and reviewed topics such as drafting contract language, presenting proposals, contract costing and member mobilization, communications and education. “We covered a lot of ground in the past couple of days and we’re excited to get to the table and negotiate a first contract that is fair and moves our group forward,” said Fletcher, the Chief Shop Steward. “We’re ready to go and looking forward to gaining the dignity and respect on the job that we very much deserve,” said Amoah, a Shop Steward. The IAM is in the process of scheduling dates to commence negotiations. Phoenix-based Jetstream workers perform critically important security sweeps and aircraft cleaning services. Earlier this year, Jetstream workers voted by nearly 90 percent for IAM representation.